Write/save/open/edit/send eMail templates, set sending schedules and manage the sending queue, it is your main work interface, all other interfaces and functions are called from here. 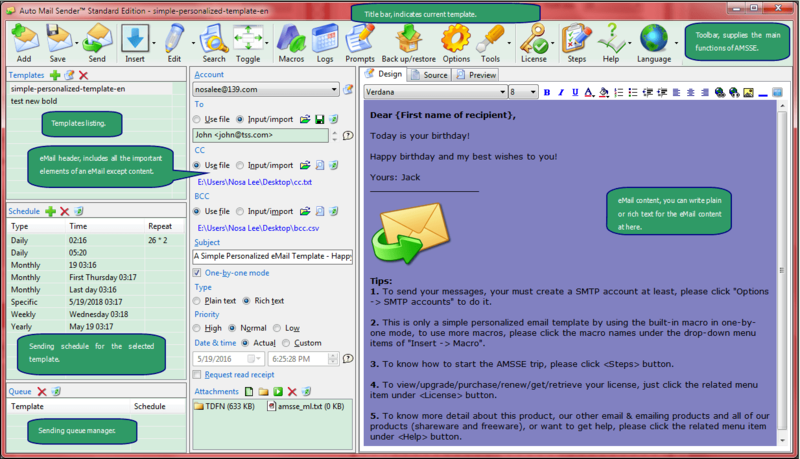 It shows automatically after you ran Auto Mail Sender™ Standard Edition, if not, please click the corresponding system tray icon to display it. Select a template will automatically save previous template if it was changed. [Account] - selects a SMTP account from accounts list to send current eMail, you can also click to manage your SMTP accounts. Tips: if the specified SMTP account is unavailable, AMSSE will check the default one. If they do not work, AMSSE will automatically select the available SMTP account to send your message. [To/CC/BCC] - specifies who and how receive the email. Use file: uses the recipients file (csv/txt/xls(x)) directly, when sending message, AMSSE will read the recipients information from this file. Input/import: input recipients or import from csv/txt/xls(x) files manually. Format: x@y.z,a@b.c,... or X <x@y.z>,A <a@y.c>,... (separated by comma (,)). [Subject] - the subject of current email, it will be used as the default template name when you save the new template. Tips: AMSSE prevents sending the no-subject eMail for anti-spam reason. [Date & time] - the sending date and time for current email. 'Actual' option: uses the system date and time. 'Custom' option: uses your specified date and time. Tips: please note that a few eMail clients/webmails may not support the custom sending time, they will always use the actual server time. [Type] - specifies the email type as 'Plain Text' or 'Rich Text (HTML)', the default type can be set in the 'Preferences' tab page on the 'Options' dialog box. If set it as 'Plain Text', the content area will display a content box only. [Attachments] - the attachments which will be sent with the message, you can add/open/run/delete/clear it/them via clicking the picture buttons. Supports folder attachments and drag-and-drop. Tips: a few SMTP servers reject sending the unsafe executable files (such as .exe/.bat/.com) directly, the servers will return the 552 error code (for instance: smtp.gmail.com), you can compress these files as .zip/.rar or others for sending to solve this problem. Now, even the compressed file that include the unsafe executable files are not allowed to send also, such as Gmail, please click here to know more details. So, to ensure your message can be sent successfully, please rename the unsafe executable files and then compress them for sending (tell receivers the original file names in content). [Content] - the content of current message, supports plain and rich text both. For the 'Rich Text', AMSSE provides three tab pages and a toolbar to assist you to write the email content. 'Design' tab page: default tab page, the WYSIWYG HTML email editor. 'Source' tab page: uses to view or edit (for the senior users) the HTML source code for the email. 'Preview' tab page: uses to view the actual email effect. Toolbar: provides the common functions for editing a HTML email. Tips: usually, you only need to use the 'Design' and 'Preview' tabs in rich text mode, if you are good at HTML programming, you can also write HTML code in the 'Source' tab page to get more professional effect. To expand/restore the "Templates", "Schedule" & "Queue", "Header" and "Content" areas, please check/uncheck related menu items under toolbar button. To maximize/restore the [To/CC/BCC] input area, just double-click it. The input prompt function is available for [To/CC/BCC] field when you selected 'Input/import' option. After saved templates/recipients or sent emails (manually), the information of recipients will be automatically added to the prompt list uniquely. When you are typing in these fields, the prompt list will automatically show under the input box if AMSSE found the similar item(s) (fuzzy search, for instance: inputting 'tes' may show 'test' and 'fortest'). At this time, press <Up/Down Arrow> to select the needful item and then press <Enter> to input it, or click the needful item directly, you can also press <Esc> to hide the list. Tips: each command (toolbar button, drop-down item, small picture button) has a understandable icon and tooltips (with shortcut keys), so just move the mouse on it, you will know about its function. The following list is an extra notes. <Send> - a few SMTP servers reject sending emails to self (the sender is the same as the receiver), if your message can not be sent successfully, you may check this reason. <Toggle> - except click the subitem to show/hide related pane, you can also drag-and-drop the splitter bar between two adjacent areas to fine-tune the widths. <Tools> -> Open system address book - opens Windows system address book in Windows Explorer, you can export your contacts from there, and then use the exported file in AMSSE.
? icon - if it is displayed on the right side of a field, you need to note it, click it or read its tooltips to know about the extra information of the related field.